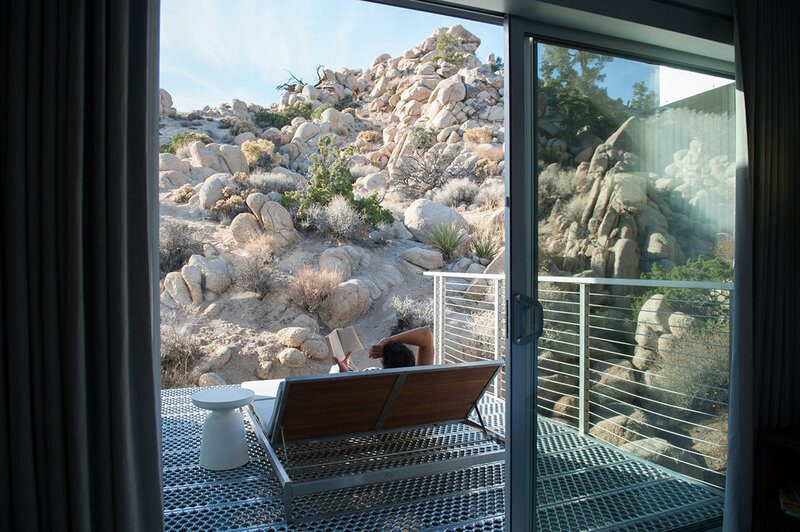 This modern, 2 bedroom home is located in Rock Reach, a private community of 320 acres near Joshua Tree characterized by expanses of heavily weathered boulders, along with ancient junipers, stunted desert oaks and resilient piñon pines. 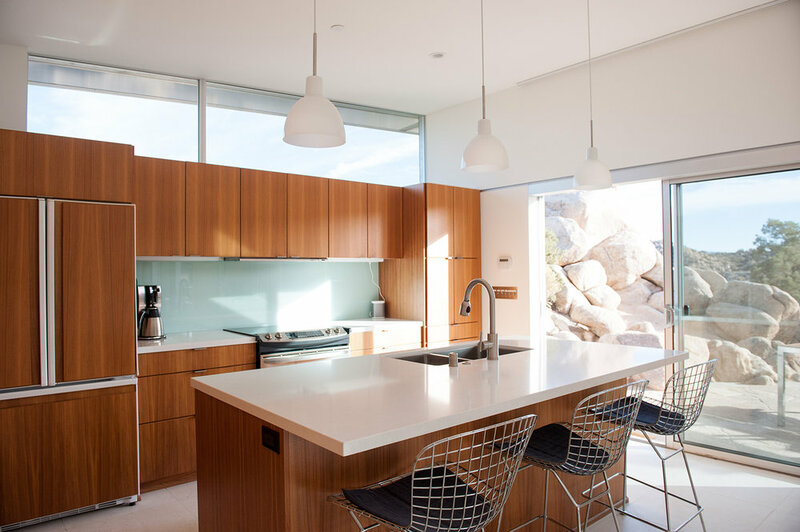 The extensive use of glass in the beautiful home is ideal for taking in the panoramic views of the untouched surrounding high desert. The main area is open concept, allowing guests to share the living space, dining area and kitchen that opens via a wall of sliding glass doors onto the large deck. 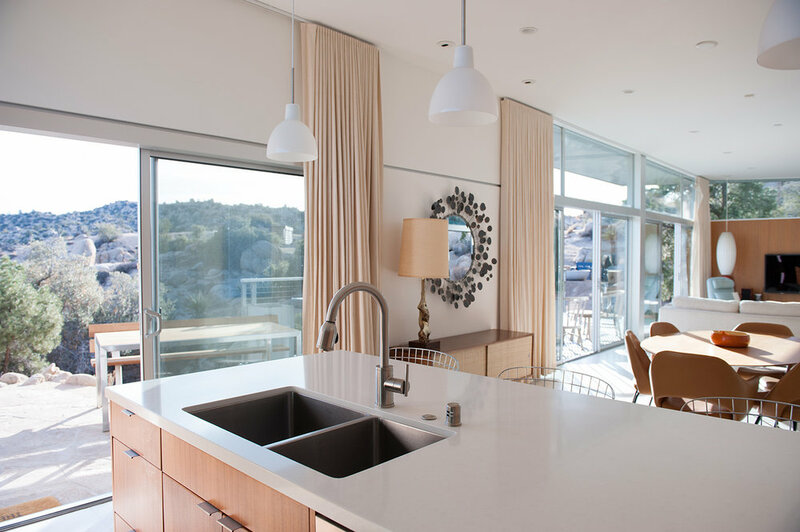 Beautifully furnished in Mid-Century decor, it is the ultimate space to relax and take in the expansive views. 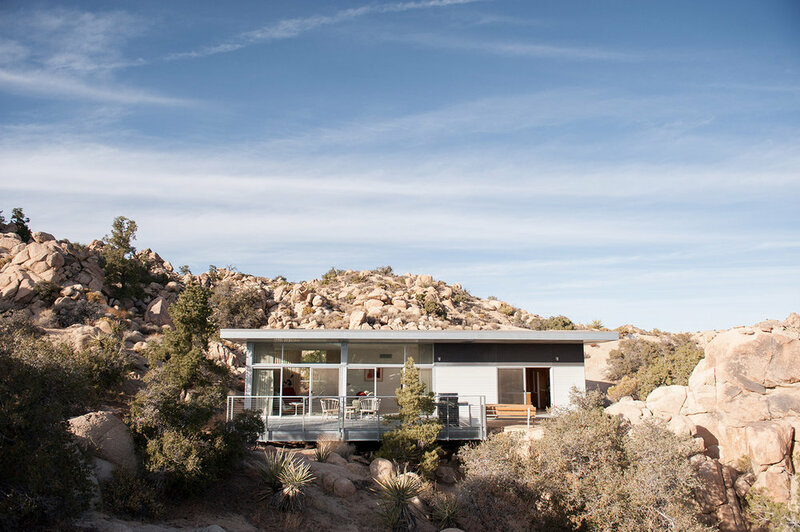 The unique design of the Blue Sky Building Systems Prefab home allows the steel and glass home to be "placed" within the boulder valley, creating a unique hideaway that absolutely must be experienced. There are two spacious bedrooms, both with large built-in closet space and king size beds. One of the rooms has sliding glass doors that open onto a small back deck, also accessible from the living room, that is home to a large star gazing/sun bathing bed. 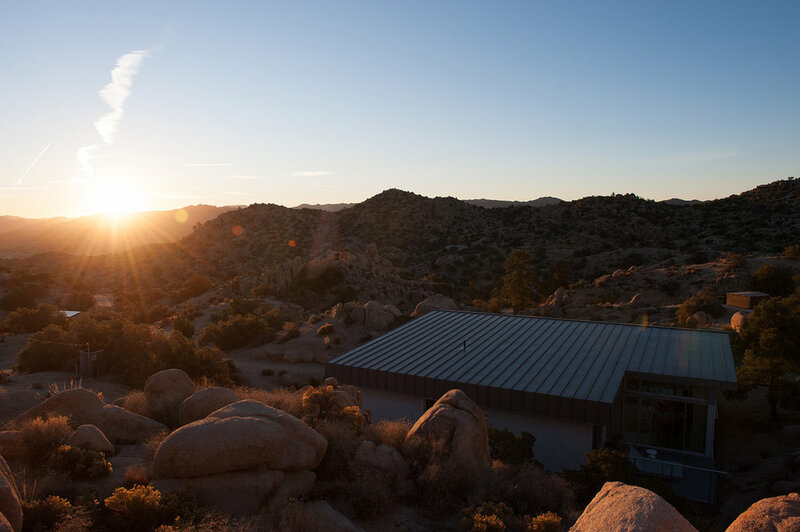 The second room has sliding glass doors that open directly to the desert and provide unobstructed views of the sunrise each morning. 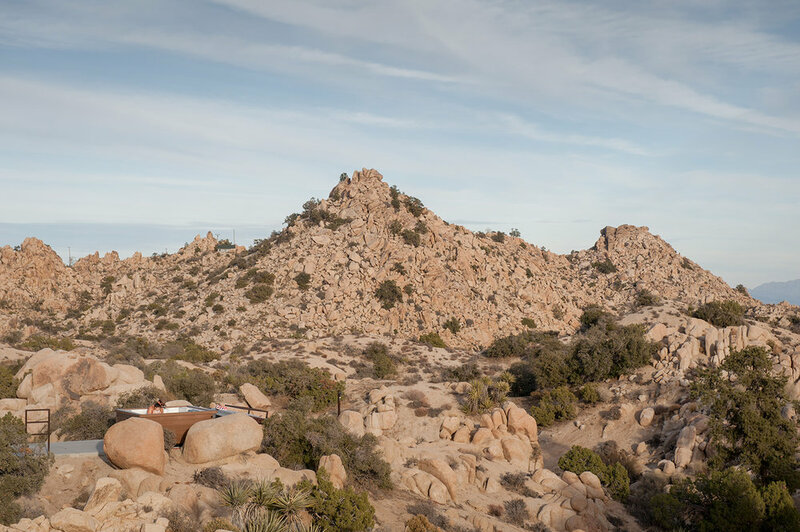 There is one bathroom with shower that opens up to an outdoor shower, partially carved into the weathered boulders. Lovely towels and linens are provided. Although the private home is only a 10 minute drive to the nearest town, we doubt that you will want to leave this spectacular haven, so we recommend bringing all necessary supplies for the duration of your stay! With a large deck, outdoor dining area and BBQ, jacuzzi with 360 degree views, sun beds, a custom outdoor fireplace and luxurious interiors, the hardest part of your stay will be figuring out where to relax first. If you do find the need for exercise, there are many nearby trails to explore. Fresh pressed juice delivery available upon request. Private massages available - please inquire if interested. Closest airport is in Palm Springs, 50 mins away. Rates start at $299 a night. A car is must in this area. Although the house is laid out on one main level, due to the nature of the environment, the adjoining areas are unsuitable for wheelchair access. Hiking, rock climbing, vintage shopping, museums, & galleries.